Water Sports – A wide range of activities is available to suit every interest and level of experience. Don’t worry if you have never tried any before, as we have guides that are more than happy to go with you or give you a lesson or two. Outdoor Family Activities – We have a range of on-site, complimentary activities perfect for families and children. To make your stay memorable, we have crafted dining experiences for you to enjoy. Upon availability and request. 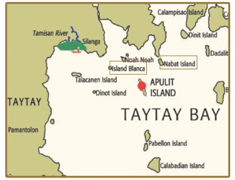 Taytay (Apulit Island) – Nabat Island has a very extensive reef area, perfect for snorkelling and diving. Its beautiful marine life contains coral gardens, flame scallops, nudibranch, lionfish, flatworms. On the other hand, Isla Blanca is a Spanish term for “White Island.” Guests can opt to just relax on the beach, snorkel or swim just in front of the island. 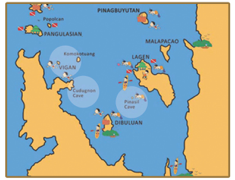 El Nido (Miniloc Island, Lagen Island and Pangulasian Island) – Find out how Snake Island got its name, climb into Cudugnon Cave, and see the cathedral-like formation of Pinasil. Our guides will give you fun facts and interesting stories as you discover the famous spots of El Nido. Big and Small Lagoons – They say you haven’t really gone to El Nido if you haven’t seen the iconic Big and Small Lagoons. If you only have one day with us, then this is the place to see. Take photos at the Big Lagoon to your heart’s desire, as it is impossible to take a bad one. Then head over to the Small Lagoon to kayak – your guide will show you its hidden entrance. Have a picnic by the beach at Entalula Island. Rest and digest your lunch on one of our cabanas or on a hammock under the trees. You can also snorkel, kayak or play volleyball. Adrenaline junkies can try rock climbing (October to May). There is a limestone wall available for climbing beginners to advance climbers. Visit Dibuluan Island for lunch and try snorkelling and various water sports available such as hobie cat sailing, wind surfing, and kayaking.